The property, which totals 67,192 sq ft, was completed in the 1970s and comprises five bays of steel frame construction with block work walls under metal cladding to its elevations and roof. There are intermittent translucent roof panels. The two storey office and ancillary accommodation is located within the main warehouse. The office accommodation is of basic specification. Eaves height of 8.0m rising to 11.9m at the apex. The front of the warehouse is accessed via a single, manually operated roller shutter door, which is approximately 3.5m wide and 5.2m high. There are a further three electronically operated roller shutter doors to the rear elevation. There is a forecourt to the front elevation offering approximately 30 car parking spaces, and a loading turning bay area to the rear with 10 marked trailer bays. The site area is 3.3 acres, which equates to a site coverage of 50%. 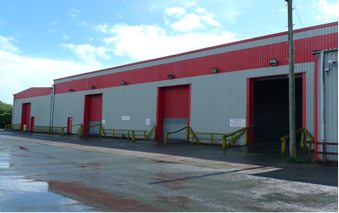 The property occupies a prominent position by the entrance to the Pant Industrial Estate, which is an established trade counter location adjacent to the A465, approximately 4km north of Merthyr Tydfil town centre. Tenure: 999 year lease on a peppercorn rent. Successful sale of property to a special purchaser who required vacant possession, and simultaneous surrender of existing lease for a premium from a tenant no longer in occupation.